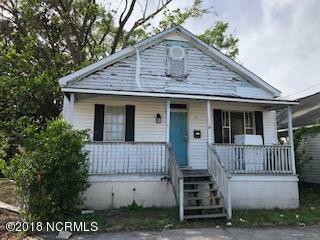 Great investment opportunity on this 2 bedroom 1 bath home! An additional vacant building lot next door at 104 S 11th Street, Parcel # R04818-037-005-000 is available for $25,000. Home is currently rented, tenants have been in place for 5 years, paying $675 a month on a month to month lease. Home being sold AS IS, no repairs will be done. A home warranty is included. Listing provided courtesy of Greg Barber of Re/Max Essential. © 2019 NCRMLS. All rights reserved. North Carolina Regional Multiple Listing Service, (NCRMLS), provides content displayed here (“provided content”) on an “as is” basis and makes no representations or warranties regarding the provided content, including, but not limited to those of non-infringement, timeliness, accuracy, or completeness. Individuals and companies using information presented are responsible for verification and validation of information they utilize and present to their customers and clients. NCRMLS will not be liable for any damage or loss resulting from use of the provided content or the products available through Portals, IDX, VOW, and/or Syndication. Recipients of this information shall not resell, redistribute, reproduce, modify, or otherwise copy any portion thereof without the expressed written consent of NCRMLS. Data last updated 2019-04-25T11:59:39.983. ©2016 CENTURY 21 Sweyer & Associates. CENTURY 21® is a registered trademark owned by Century 21 Real Estate LLC. Equal Housing Opportunity. Each office is independently owned and operated.